Women in India, Nepal and Sri Lanka draw Rangoli using finger tips almost every morning in front of their house. The word Rangoli derived from Sanskrit “rangavalli”. This traditional art is part of religious ritual and has several significance. Each religious ceremony has its own unique form of Rangoli designs. While Rangoli increases the beauty of house and ceremony, it also is considered auspicious. Either the curve or straight lines are drawn using dots. Drawing is done by using fine stone powder (or rice powder) without using ruler or brush. Little Rangoli powder is taken using thumb and index ginger and slowly released to draw a curve or straight line to connect dots and at the end a beautiful art will be formed. To make attractive and visible colors filled inside Rangoli designs. 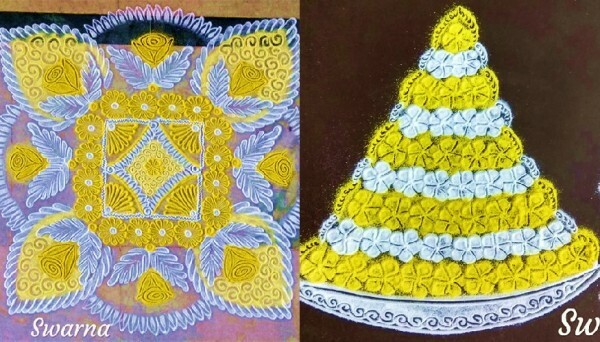 Rangoli and mandala are two different arts. Mandala is spiritual and ritual symbol used on specific occasions. Rangoli is for daily traditional art. 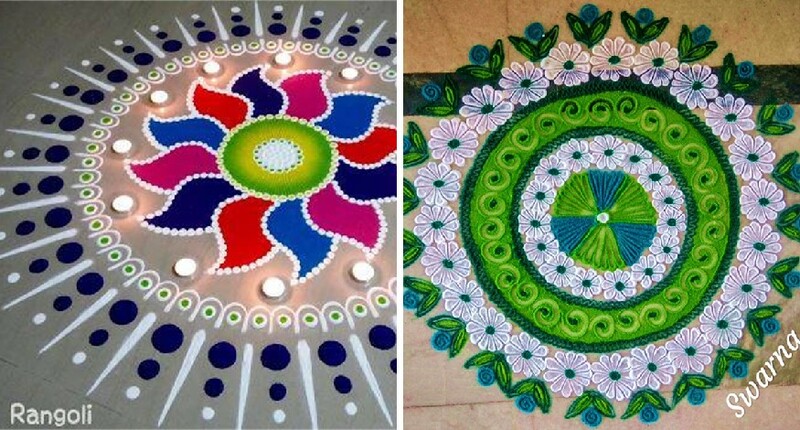 Some of rangoli designs looks like mandala vice versa. Traditional form which is dominant where lines, curves, circles connected. This form is spiritual and believed to bring good luck to house. Ornamental: Here the focus is on leaves, creepers, birds, flowers etc and is more attractive. Here colors also dominate. The main structure of traditional Rangoli is in its shape. It can be in various types of geometrical forms such as triangle, square, rectangles, octagons, hexagons, circles and the dots that are put to connect the lines are based on math. When Rangoli is drawn design is plays significant role. According to ancient studies it channelizes its energy level. It means if one wants to underplay energy then they can go with round design. If one wants to improve energy more then they can draw designs with sharper sides and edges. It means the level of your energy increase depends on your focus on designs of Rangoli. To create energy in oneself they can take help of Rangoli designs, geometry symbols, lines, curves and colors and of course dots. While connecting the dots one should focus because one small mistake will ruin the shape. Daily drawing and practice helps to connect the dots. 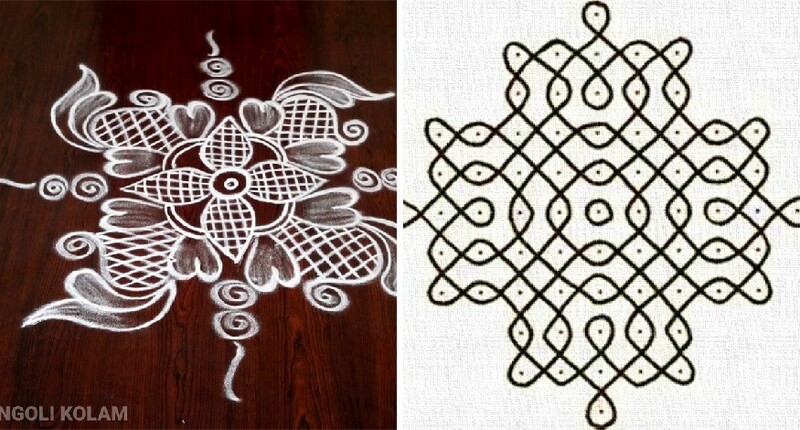 These Rangolis are not permanent when drawn on floor and everyday a new design need to be drawn. This means eventually the imagination kicks in and a person becomes expert in creating her / his own Rangoli designs. 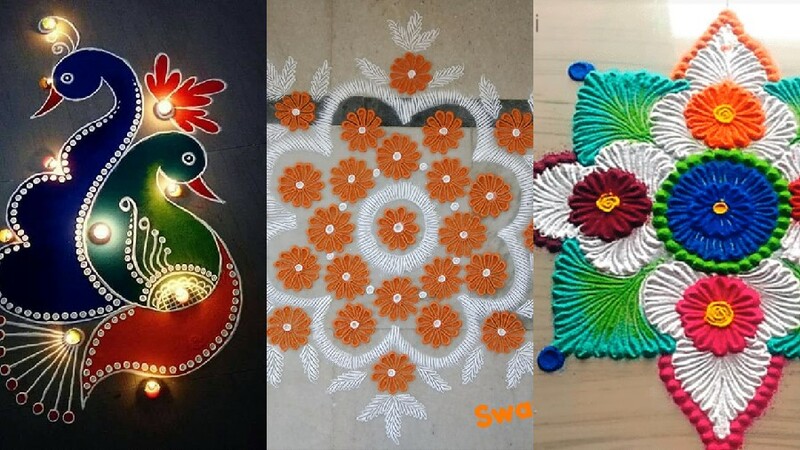 Do you Rangoli benefits health?Rangoli art is traditional and has many significances. Do you know it has positive effect on health? Rangoli drawing calms mind and reduces stress and depression. As per belief Rangoli keeps away negative vibes from life. If you want to learn art of Rangoli, start with simple designs and you will end up in creating simple to complex design and it makes your mornings interesting and encourages you to be creative throughout the day!